From Third World to First World – Through Innovation, Technology and Manufacturing. Another Sunday and I woke up early in the morning to have some local coffee before heading to the airport. When I reached Singapore Changi airport, I started to consider all the airports I have visited. After going through my fingers for a couple of rounds, I realized that I have been to >20 countries and >60 airports around the world. Over the years I have spent many hours waiting in airports and I started to wonder why airports around the world spend so much money on doing up and renovating their older facilities. I have seen many transformations of other airports and tend to compare these airports with Singapore. In one of the fastest growing countries – China, I have been to many local domestic airports. They are all built with fine architecture and a sense of ecofriendly design. The government is determined to improve infrastructure by building roads and highways, to link airports to cities. There is an old saying that to connect the world, you need a good transportation system. Like the Romans 2000 years ago, they build roads for easy transport of goods and soldiers. There is no comparison with the advanced infrastructures, which China has spent so much money on and this gives the first world countries a head start. So this lead me to think about the extensive changes, which have taken place in my region over the last few years. Overall we have seen a transition in Asia from a 3rd world to 1st world region in terms of innovation, technology, and manufacturing. This is due to investment from government and private sectors and ensures that Asia will be a key player in the world economy. Asia is a key and important market for Electron Microscopy and EDAX has benefited too as users upgrade older system for newer ones. EDAX now has installations on EM systems from all the principal global manufacturers. With the new products we have launched recently, we are confident that we can generate a good traction for business in the various countries of the region. China is always hungry for new technologies and with our latest EDS and EBSD products, there is a good flow of new inquiries. After the launch of the ELEMENT Silicon Drift Detector (SDD), the China team has sold >30 units in 6 months. EDAX has been selling averagely two EBSD per quarter and this volume has generated a new breed of EBSD users. More and more EBSD applications have been presented and discussed at local conferences. EDAX can do our part by more sending more experts from the factory to have sharing sessions either during conferences or through individual meetings. EDAX has grown in India over the years and has become a top supplier for EDS and EBSD. We currently have >50% market share for EBSD and have been recognized by key tier 1 universities. We have been successful in improving our market position through consistency and persistence. There were challenges for EDAX but we overcame them one at a time and we now have support from all major Electron Microscope suppliers. We now have a good team in India, comprising sales and applications support for all the local day to day requirements. 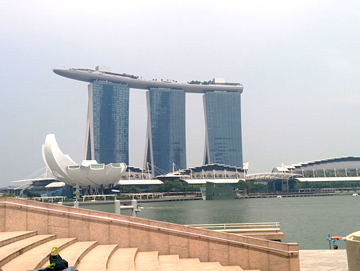 Singapore has been a key location for some time with many high end system purchases by industrial and academic customers. With the influx of manufacturing companies setting up facilities in South East Asia, this create good opportunities for EDAX products. One recent success we had was the sale of ORBIS µXRF analyzers into the forensic and electronic industries. We have also successful penetrated Malaysia MJIT with EDS and EBSD on a JEOL SEM. This will be a good reference for future potentials in the S.E.A. region. Asia will continue to be a hub for research and manufacturing. We will expect to see assembly facilities setting up in Vietnam, Philippines and Malaysia, new requirements for Electron Microscopes and EDS. India government is determined to create a “Build in India” campaign and attract foreign investment to improve India economy. All this development, which is so obvious in the airports and transportation systems of the region, can also be seen in many industries, including microscopy and microanalysis. If you would like to hear more, please give us a call or come and pay us a visit! As I write this I am on my way back to the US after having spent the past week in Singapore with my schedule filled with meetings and training sessions with both local microscope vendors and for customers, and discussions with the EDAX sales and applications people from China, India and Singapore. A good amount of time was spent discussing detector specifics and how to really make the advantages of our silicon nitride window and Elite detectors shine, but there was also general knowledge transfer and comparison between the challenges that we see in the different regions. 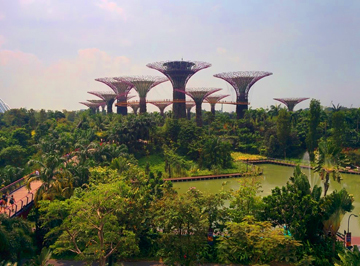 Singapore is definitely a change from the east coast of the United States, with the tropical climate and architecture including a sky-rise hotel with a ship parked on top, buildings with the exterior designed to look like the shell of the Durian fruit, or giant steel tree structures in the middle of the city park. But it is also a central hub where we have one of our regional offices and a state that invests heavily in the knowledge industry. While the primary reason for my trip was the training of our local team and introduction of new and up-coming projects and software features, I also wanted to gather input and knowledge to bring back to our main office in Mahwah. Often we get so used to what we see every day that we forget that there’s a whole world out there. What we in the US think should be the major focus can be of less interest in other regions and vice versa. One of the things I learned was that the Asia/Pacific region sees a larger proportion of operators being technicians with limited insight into the advantages and limitations of the technique, than we usually do in the US and Europe. At the same time the microscope vendors were impressed with the level of analysis and how powerful the TEAM™ software is. These are things that we will have to take into consideration for future development, making it easier for novice users to apply the flexibility and power of the software but still allowing our advanced users access to all the bells and whistles that we have to offer. Although we have conference systems, phone meetings and e-mail, there’s definitely something to be said for meeting face to face. The discussions and interactions flow much more easily when we can actually point to the same thing on the screen, draw on a piece of paper or just chat over coffee. Of course it can be a little overwhelming to come back to the hotel after a long day and find an overflowing inbox when you open the computer (not to mention getting calls at 3 AM from people who aren’t aware that you are travelling), but this is easily compensated by the experience of the culture, local food, and the chance to catch up with colleagues. Who knew that fried fish skin with salted egg goes so well with a cold beer? With my Singapore trip over, I am making my way through the 24-hour travel back to the US and I have time to contemplate the experiences and discussions that I have had during the past week. There’s plenty of data to analyze, ideas for new software features, and input from microscope vendors to consider, but all that will have to wait. For now, it’s time to catch some sleep, try to get back on east coast time and maybe not worry about the line at immigration and New York traffic till I actually have to deal with it!